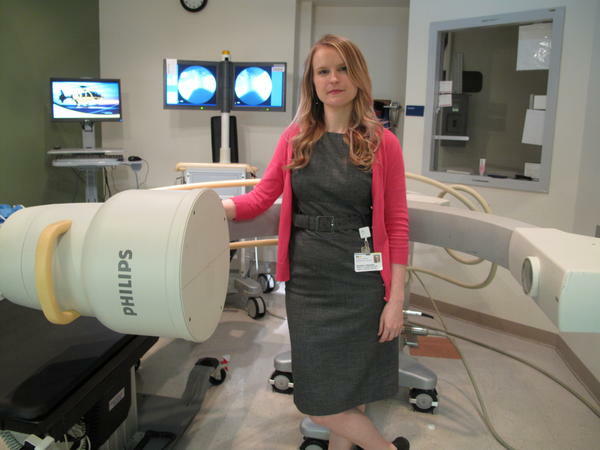 Former schoolteacher Liz Stepansky at her new job as a speech pathologist at a hospital in Washington, D.C. Growing up, Liz Stepansky, the daughter of two schoolteachers in small town Illinois, thought teaching was the way to a stable, meaningful life. "My dad would have students that would come back and visit him even years after they had graduated high school," she said. "And to see him develop relationships like that, it seemed like a pretty important job. I liked that." After graduating from college in 2008, Stepansky, now 33, decided to follow in her parents' footsteps, and was ecstatic when she landed her first job as a public middle school teacher in South Carolina. "I couldn't wait," she recalled. "I had ordered all the books, and planned out my classroom and how I was going to have things organized, and I was ready. I was ready to begin my teaching career." But when September rolled around, Stepansky found that she "had no idea" what she was in for. She said her middle school students dialed 911, threw balloons filled with bleach and ink in hallways and constantly pulled the fire alarm. "Four of those occasions were actual fires started by students," she said. "Another teacher had a dead mouse put on her chair. I had a student put a frog in my coffee." As her frustration with her students' antics built up, so did the hours she spent at school. Way past the dismissal bell, she was "calling parents, doing lessons preps," she said. "I'd go home and sometimes I'd spend an hour grading papers. And then I'd go back the next day and do it all over again. ... I remember my paycheck being $800 and something every two weeks." Stepansky transferred to another school, this one in Virginia, and encountered similar frustrations. After two years of teaching at public middle schools, Stepansky wondered: Was she wasting her time? Then a re-connection with an old friend brought her back to another childhood interest: Speech pathology, a field of assessing, diagnosing and treating communication and swallowing disorders. "I got a friend request from someone I was best friends with in fifth grade, and I noticed that she was a speech pathologist," Stepansky said. "Growing up as a child, I went to a speech pathologist at our school. I couldn't pronounce my R's and my S's. ... I started thinking, 'Maybe that would be an option to consider.' "
All of the things that attracted Stepansky to teaching in the first place — education, compassion and interest in the progress of others — were present in this job, too, and its prospects were good: Schools and hospitals are in dire need of speech pathologists, and the BLS projects that speech pathologist employment will grow 18 percent from 2016 to 2026, "much faster" than the average for all occupations. Meanwhile, teachers who are college-educated are facing higher wage gaps than ever, according to the EPI. After scouring the web to learn how to enter the field, Stepansky realized she would need to go back to school. She quit her teaching job, applied to the University of Virginia's graduate program — and was denied. She took a job at a veterinary clinic, and volunteered at a local hospital and enrolled in prerequisite classes at a community college to strengthen her follow up application. A year after her first attempt, Stepansky was accepted to UVA. She spent two and a half years taking classes and doing clinical work, and graduated to a fellowship in her favorite clinical placement — working with adults in a hospital. Now, Stepansky has been working the National Rehabilitation Hospital in Washington, D.C. for just over a year. A standard day involves diagnosing patients and designing treatment strategies, including singing songs and playing card games designed to build patients' language and communication skills. "I've made a change in the people that I see, but kind of at the heart of it, I'm doing the same thing," she said. "I'm showing someone how to do something, and eventually do it without me." Most of her Stepansky's patients are persons who are re-adapting to life after experiencing strokes. Stepansky said working to rehabilitate their language and speech abilities is particularly emotional. "They are so much more appreciative, because they know the difference," she said. Stepansky said she has no regrets in changing up her career path. "As I was teaching, I kind of was looking at my friends who had established careers and knew what they wanted to do thinking gosh, I wish that was true for me," she said. "To be in a job where I love what I'm doing is kind of a gift, and it makes going through this whole process and this whole transition more than worth it." And now it's time for another installment in our series Brave New Workers - stories of people adapting to a changing economy. UNIDENTIFIED MAN #1: I need a job, and I don't have a skillset other than flying. UNIDENTIFIED WOMAN: One day, you might be cleaning the toilet. The next day, you might be doing some potentially Nobel Prize-winning science. UNIDENTIFIED MAN #2: In 1979, I started my trucking career. And I wanted to have the American dream. MARTIN: Today, we're going to hear about how sometimes the expectations for a new job don't always live up to the reality. LIZ STEPANSKY: So I first thought about being a teacher in high school. MARTIN: That's Liz Stepansky. She says that, growing up in a family full of teachers, she always thought of the profession as a means to a stable, yet meaningful life. STEPANSKY: My dad actually was my teacher in high school. Both of my parents were teachers, and that's how they had originally met. MARTIN: Stepansky says she loved seeing the warm, lasting relationships her father built with his students, many of whom were her own classmates. STEPANSKY: They would come up to me when I was in the hall and say, Liz, I love your dad. I love his class so much. You know, my dad would have students that would come back and visit him even years after they graduated high school. MARTIN: So when it came time for Stepansky to choose her own career, she decided to follow in her parents' footsteps. And after college, she landed her first job as a middle school teacher. STEPANSKY: I couldn't wait. In my mind, I had ordered all the books and planned out my classroom and how I was going to have things organized. And I was ready. I was ready to begin my teaching career. But I had no idea what I was in for. A student dialed 911 in my classroom. Students started bringing in water balloons. Then the students decided that water wasn't exciting enough, and so they started filling balloons with more interesting substances like bleach and ink and started throwing those. One day, we walked through a hallway, and there were all these raw eggs on the lockers. Another teacher had a dead mouse put on her chair. I had a student put a dead frog in my coffee. And probably sometime from February to May, we almost constantly every day had a fire alarm pulled. And four of those occasions were actual fires started by students. At that point, I was just thinking this is way different than I thought it was going to be. This is so much harder. And you really do work a lot of hours. It's not an 8 to 3:30 job and then you just skate home. You're there calling parents. You they're doing lesson preps. And I go home, and sometimes I'd spend an hour grading papers. And then I go back and do it all over again the next day. And after taxes, I remember my paycheck being 800 and something every two weeks. And I started thinking, well, maybe, maybe I don't just need a different teaching job. Maybe I need a different career. So we're going up to the second floor, which is a stroke recovery unit. So I've been working at National Rehabilitation Hospital in D.C. as a speech language pathologist now for just over a year. And what I would start off making as a first year speech language pathologists was well over what I would be making as a teacher. So I'm taking the patient in his wheelchair for a patient therapy. I forget when - I think I got a friend request from someone that I was best friends in fifth grade. And I noticed that she was a speech pathologist. And I knew about speech pathology because growing up as a child, I went to a speech pathologist at our school. I couldn't pronounce my R's or my S's. And I loved speech pathology as a kid. We would play fun games. We'd play card games. We would do these funny, silly songs that would warm up our lips and our tongue. UNIDENTIFIED MAN #3: (Singing) I'm going to let it shine. STEPANSKY: (Singing) I'm going to let it shine. And I started thinking, maybe that would be an option to consider. STEPANSKY: And actually, as we're singing this, I want you to look at my lips. I've made a change in the people that I see, but at kind of at the heart of it, I'm doing the same thing. I'm showing someone how to do something and eventually do it without me. How about this? It's still in the wrapper. That's why it's making that noise. You realize that being able to communicate is this key essential part to your quality of life. Yeah. You use it every single day. You know what it is. You're just having a hard time accessing that word. And we don't give a second thought to the fact that I can go to a restaurant and order exactly what I want. You know, I can call up someone I love and tell them that I love them. UNIDENTIFIED MAN #3: ...A toothbrush. When I see a patient who's had a stroke that's affected a language area, they're so much more appreciative because they know the difference. STEPANSKY: I think as I was teaching, I kind of was looking at my friends who had a established career and knew what they wanted to do, thinking, gosh, I wish that were true for me. And through all of this, I'm almost more thankful because I'm more grateful. I know what it is like to have a job that I hate every day. And so to be in a job where I love what I'm doing is kind of a gift, actually. And it makes going through this whole process and this whole transition more than worth it. STEPANSKY: (Singing) But now I see. Let me hear you say see. MARTIN: Liz Stepansky is a former school teacher. She now works as a speech pathologist. And she spoke to us for our series Brave New Workers on people adapting to the changing economy. Transcript provided by NPR, Copyright NPR.